Hand Trowel - Ideal for working in small or tight spaces. I use the hand trowel for planting, weeding and generally ‘everyday’ jobs on the plot. I use mine in the plot, in borders and all my pots. Length 31cm, width 9cm. 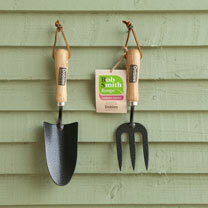 Hand Fork - Perfect to use in beds, borders or pots.This hand fork will allow you to plant, weed and harvest with ease. It’s one of those tools that you don’t realise you can’t live without until you misplace it! Length 28.5cm, width 7.6cm.